This last week has featured temperatures over 100 degrees, Fahrenheit! Our house is not designed for extremes of heat and it is difficult to keep it anywhere near a comfortable temperature. Outside, it’s been too hot to do things that need to be done. While we ignore them, the weeds grow gleefully upward, blooming and spreading their seeds. What’s a person or dog to do? Ignore the weeds; that’s for sure. Sunday the thermometer topped out at 110! In the morning we took the dogs and a PFD and some floaty toys and went to the lake. We got an early start so we could find a coveted place big enough for us and the dogs without bothering other recreaters. There were several rowing sculls on the water and a canoe and some people swimming for exercise or fun. The dogs were ecstatic and we threw and threw their bumpers. When I thought they might be tiring, I put them away. Sky disappeared into the bushes and came out with a brand new tennis ball! That dog has a nose for tennis balls. If you ever lose one, call on Sky and she will find it for you. But then you have to throw it for her. Again and again. We floated around in the water with PFD, just relaxing and enjoying the cooling lake. Back at home, we all felt somewhat rejuvenated and got a little bit of work done. Late in the afternoon we packed up a picnic and drove to Harts Pass at about 6100 feet elevation. It was much cooler up there – in the sixties and it felt SO good. There was a threat of thunder storms and we had a little bit of light rain but nothing that chased us away. Ken chatted with a fellow who had just started the Pacific Crest Trail (PCT), traveling north to south. He plans to arrive at Mexico in November. We wished him good luck. The mosquitoes were annoying when we ate our picnic so we ate fast. Then we headed out for a short walk on the PCT. 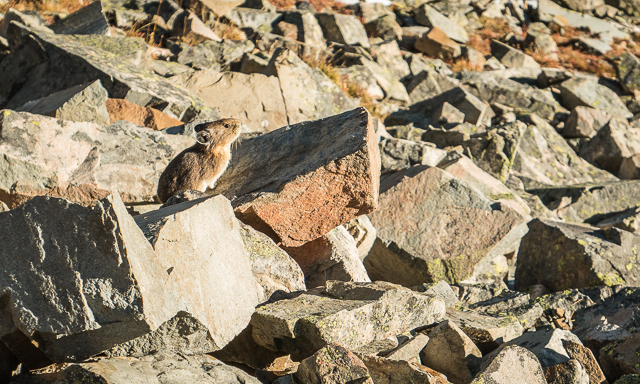 We were greeted by pikas, hoary marmots, Swainson’s Thrushes and a few wildflowers. There were small patches of snow – nothing like last year. It’s already very dry. Many of the creeks are quite low or even dry and it’s not even July. Compare that with a day on the same part of the trail last year in July here. The flowers are not as floriferous either. This is the snow field featured near the bottom of the blog post from last summer. Clearly, I am equipped for whatever the day has to offer. Did you lose a glove?